After selection of a good site, proper site preparation is one of the most important factors in the ultimate success or failure of a vineyard. This is the time when changes can be made to the site to improve soil conditions, water handling, and the overall efficiency of managing the vineyard. Many experienced grape growers will say that investing the time and money in good site preparation will save both in the long run. This fact sheet describes some of the more important issues that vineyard owners should address prior to planting vines. Ideally, the land where you will be planting your vineyard will already be clear of trees, large rocks, shrubs and other such objects. This is not always the case, however, and the more of these obstacles that can be removed before planting the vineyard, the easier your work will be in many aspects of vineyard management. Figure 1. Be sure to clear the site of trees, large rocks, perennial weeds, and anything else that will hamper good vineyard management. While it will depend on the type, size and amount of material that needs to be cleared from the site, you will probably need to hire a heavy equipment operator to do much of this work. If you are planting your vineyard in an agricultural area, it is possible that a local farmer may be able to do this work for you, or they can probably suggest somebody locally who could do the work. While the lone, majestic tree standing in the middle of a vineyard can be a picturesque image, it can cause many problems with the establishment and management of the vineyard. Remove all trees and woody vegetation on the site. It is best to have as much of this done as possible by heavy equipment that can push the trees and vegetation over, which will help to bring up a number of the roots as well. It may be necessary to remove trees along the periphery of the vineyard site as well, in order to reduce shading potential on the vines. The rule of thumb is that the vines should be planted no closer to a treeline than the average height of the trees. While this area will not be planted to vines, it is not wasted space. It is important to have large enough "headlands" (the area around the vineyard where equipment can travel and turn around) around the vineyard as well, and this extra cleared space can be used for that purpose. In addition, clearing trees around the periphery can help to improve air movement and reduce pest pressure as well. While large rocks underground won't directly impact vineyard operations above ground, they can make things difficult when it comes to planting the vineyard or pounding posts into the ground. Large rocks also take up space where soil - and the nutrients and water that it holds - would otherwise be. This means there is a lesser volume of soil that the roots can explore. To some degree, this might be beneficial, but this effect can be highly variable over the total area of a vineyard. Over the long haul, vineyard management will be easier if the rocks are removed from the vineyard before planting. Removing perennial weeds such as poison ivy, poison oak, and Canada thistle doesn't necessarily require heavy equipment, but it is an important part of vineyard preparation. Eliminating these weeds is significantly more difficult once the vineyard is planted. The best way to eliminate these is to apply a systemic herbicide, such as glyphosate-containing products like RoundUp, to the foliage of the plants in the fall. Applying herbicide in the fall will help to move the material into the roots so it can kill them as well. If the plant has a larger, woody trunk or stem, another option is to paint concentrated herbicide directly on the trunk after cutting off the top of the plant. Some perennial weeds can be very difficult to completely eliminate from a vineyard in a single year, so it make take several years of effort to accomplish this. Further information on this subject can be found on the page Weed Management During Vineyard Establishment. One of the most important tasks in preparing a new vineyard site is the preparation of the soil. Once the vines are in the ground, it is much more difficult to influence the conditions of the soil where many of the roots will be located. Soil testing is used to determine if any nutrients need to be added to the soil, or if the acidity needs to be adjusted, before any vines go into the ground. Soil sampling should be done no later than the year before planting, and preferably earlier if possible. This will allow enough time for any recommended nutrient additions or pH adjustments to be made before final field preparations such as planting a winter cover crop. Soil samples can be analyzed by commercial or university-affiliated laboratories. These laboratories can also provide materials for you to use to collect the samples, including information forms and sampling instructions. A partial list of these laboratories is included at the end of this section. If the site is uniform and flat, a single soil sample can be taken that will represent the entire site. As the amount of variation in the soils and topography increases, so should the number of samples that are taken. Soil maps, available from your county's Soil & Water District or Cooperative Extension office, along with just good visual observation can give you a sense of how variable the soils are on your site. You can also use the Natural Resources Conservation Service 'Web Soil Survey', which provides online access to the information contained in the county soil survey books (you will need a fast Internet connection and a little patience when using the website, but it can be worth it). The Web Soil Survey page is located at http://websoilsurvey.nrcs.usda.gov/app. While soil maps can give you a sense of the variability of soils on your site, the only way to truly understand soil characteristics is to take soil samples. When sampling before planting a vineyard, both the surface soil (0-8" depth) and the subsoil (8-16" depth) should be sampled. Conditions in the subsoil can be quite different from those on the surface, and it is here where most of the vine's roots will be found. It is therefore a good idea to try to correct any deficiencies at the subsoil level as well as those in the topsoil. This is only realistically possible before the vines are planted as it requires deep plowing that would disturb the vines and trellis if they were already in place. Whichever laboratory service you choose should be able to provide instructions on how to collect the samples and submit them for analysis. Most laboratories should also provide recommendations on how to address any issues that are identified by the sampling. You can also contact your local Cooperative Extension office for assistance with interpreting the results of your samples. As mentioned before, most laboratories will provide recommendations for adjustments to soil acidity and plant nutrients based on the results of your soil tests. It is less likely that they will provide recommendations for organic matter, although it is something that you should pay attention to as well. Adjusting your site's soil pH prior to planting the vines is one of the most critical steps in site preparation. Soil pH plays an important role in the availability of nutrients like potassium, phosphorus, magnesium and micronutrients. It also influences the availability of aluminum in the soil, which is toxic to vine roots. Figure 2. If soil tests show the soil pH is low, apply lime prior to planting to raise soil pH. The lime will need to be plowed into the soil to be effective, which is why it is best to adjust soil pH prior to planting. Adjusting soil pH, especially in the subsoil (8" deep), where most of the vine's roots will be found, is virtually impossible to do once the vines are in the ground. This is due to the fact that most sites in New York and the eastern U.S. that require pH adjustments have high acidity (i.e., low pH) and therefore need to have lime added to them to raise the pH. Lime moves very slowly through the soil profile, so it needs to be plowed into the soil in order to get to the depth of the subsoil. Obviously, this can only be done when there are no vines or trellis in the ground, so this work needs to be done at least one year prior to planting. The optimum range for soil pH will depend on the varieties of grapes that you are looking to grow (See Table 1). Table 1. Optimal soil pH ranges for different categories of grapes. When you receive your soil test results, you should have soil pH information for both the surface soil and subsoil layers. Most laboratories will provide recommendations for how much lime to add to the soil to reach a certain soil pH based on the type of grape that you will be planting (which you indicate on the information form that you submit with your sample). If the tests recommend the addition of large amounts of lime, and time allows it, it might be preferable to split the lime application over two years instead of making one very large application the year before planting. Calcitic ("calcium") lime - Lime that is almost purely calcium carbonate, with very little other materials. Dolomitic ("mag") lime - Limestone that contains carbonates of both calcium and magnesium. Both are able to raise soil pH, but dolomitic lime can be used to adjust magnesium levels in soils as well. If magnesium levels in the soil are adequate, calcium lime can be used instead. Availability of these materials may depend on location, but both should be fairly easy to get in areas where there is agriculture. Ask your supplier for specific information regarding the lime you purchase, including calcium carbonate equivalence (CCE), fineness of the material, and the amount of calcium and magnesium (if purchasing dolomitic lime). If you have any specific questions about the recommendations regarding soil pH adjustment for your site, contact your local Extension office or one of the grape extension personnel in your state. Just like humans, grapevines require certain amounts of different nutrients for proper shoot growth and fruit development. While nutrient deficiencies identified in soil tests can be addressed after planting, it is much easier to make adjustments before putting vines in the ground, similar to soil pH adjustments, particularly if larger adjustments need to be made. More often than not, the nutrients that most often require adjustment prior to planting are potassium (K), magnesium (Mg) and phosphorous (P). Compare results of your soil samples to those in Table 2 to see if any adjustments are needed before planting your vines. Table 2. Target ranges for nutrients in vineyard soils before planting. Source: Winegrape Production Guide for Eastern North America (2009). Some soil test results may be reported as pounds per acre (lbs/acre) instead of parts per million (ppm). If so, simply divide the number given in lbs/acre by 2 to get the equivalent in ppm. Or to convert the numbers in Table 2 to lbs/acre, multiply them by 2. There can be multiple materials available that can be used to add any of these nutrients to the soil. Whatever materials you buy should tell you how much of that particular nutrient is in the material. For example, muriate of potash (potassium chloride) contains about 60% potassium. If you want to add 150 lbs/acre of potassium using muriate of potash, you would need to apply 250 lbs/acre of the material to the soil (250 lbs/acre potash x 0.60 = 150 lbs/acre potassium). Use these percentages to compare the costs of different materials that supply a particular nutrient as well. Regardless of what a salesperson may tell you, most fertilizer materials break down into similar components, and can therefore their costs can be directly compared based on their percent content. Organic matter in the soil comes from the breakdown of organic materials such as plant and animal matter. As the microbes and other organisms in the soil break down organic matter, they release nutrients into the soil that plants can take up for their own use, primarily nitrogen, sulfur and phosphorous. In fact, the breakdown of organic matter is the primary source of nitrogen in most vineyards. Figure 3. Organic matter can be improved by adding compost or other organic materials. Having adequate levels of organic matter in soils has multiple benefits for vineyards, including 1) supplying nutrients to the vines, 2) improving both water holding capacity and internal drainage, and 3) helping soils to resist compaction. Soils that are very high in organic matter, however (>5%), may be less suitable for grape production because they can result in highly vigorous shoot growth that can have negative impacts on the vines' productivity and fruit quality. While soils that are low in organic matter may help to limit vine growth (which might be considered advantageous in some situations), they can also have their own share of problems including lack of water holding capacity, which can be problematic in times of drought, and being more prone to compaction. Organic matter can be increased by addition of organic materials such as compost, grape pomace or incorporating cover crops into the soil. * Inclusion on this list does not constitute an endorsement of the lab's services by Cornell Cooperative Extension. This information is provided only as a list of potential resources. The ability to move excess water away from the vines is another important consideration in choosing a vineyard site and preparing it for planting. There are two parts to the issue of water drainage in vineyards - moving excess surface water and good drainage of excess subsurface water. It is common for vineyards in New York and other parts of the Northeast to be located on sites with some slope to them to encourage cold air drainage away from the vineyard. Unfortunately, heavy rains can cause some serious problems on these sloped sites if provisions haven't been made to direct surface water away from the vines without causing major damage to the site. Measures to control the movement of surface water need to be incorporated into the initial design of the site, as they can sometimes require the creation of ponds or drainage ditches which usually cannot be created after the fact. Ideally, every vineyard would be planted on soils that drain well all on their own. Unfortunately, this is often not the case and at least a portion of a vineyard site would benefit from having some sub-surface drainage installed. Figure 4. Underground drainage removes excess water from soils that are poorly drained. 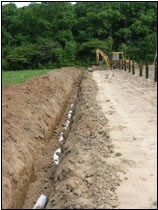 The idea behind installing subsurface drainage, or "drain tile", is that the perforated plastic pipe will help to remove excess water in the soil profile and bring it down to field capacity, which is the amount of water the soil can hold on its own, without the air space between soil particles being filled with water as well. If excess water is not drained from the soil and away from the vines' roots, root growth and function will be impaired, which will hurt the long-term productivity of the vineyard. The design and cost of a drainage system are all dependent on the site's characteristics. Traditionally, drain tile has been installed every 40' or so, but recent installations have had pipes installed as close as every 8'. Your best source of information about developing a drainage system for a new vineyard is your county's Soil and Water Conservation District (SWCD) office or local USDA Natural Resource Conservation Service (NRCS) office. Their staff can work with you to determine the drainage needs for your site and develop appropriate drainage plans. Planting cover crops prior to planting a vineyard can have a number of benefits, including improving organic matter, breaking up compaction layers in the soil profile, suppressing weeds and controlling erosion. The type of cover crop that is chosen will depend on the goals for the vineyard before planting. Two of the more critical roles for cover crops before planting a vineyard are to reduce erosion of topsoil from slopes and suppressing weed growth. 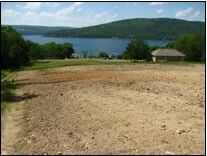 Proper site preparation will often involve significant disturbance of the soil in order to add amendments, install drain tile, etc. If a cover crop is not established soon after soil work is finished for the year, rainfall and melting snow can result in a significant loss of topsoil from the site. Sowing a cover crop will also help to prevent the re-establishment of weeds that the owner has worked hard to eliminate from the site in the first place. Another important factor in deciding which cover crop(s) to plant will depend on the time of season that the crop will be seeded. Certain cover crops are best sown in spring or early summer, while others perform better when seeded later in the summer or early fall (see Table 3). Certain benefits of cover crops are achieved purely by having the crop in place, like stabilizing soils or weed suppression. 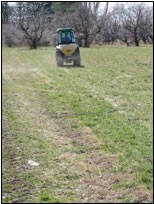 Other benefits, like increasing organic matter, are only realized once a cover crop is incorporated into the soil by discing or plowing it under. This may also influence the choice of which cover to use before planting. Source: "Cover Crops", 2010 Production Guide for Organic Grapes. NYS IPM Pub. 224. 2010 Production Guide for Organic Grapes. New York State Integrated Pest Management Publication No. 224. Cornell University, 2010 http://nysipm.cornell.edu/organic_guide/grapes.pdf. Wolf, Tony et al. Wine Grape Production Guide for Eastern North America. Ithaca NY: NRAES, 2009.